I got a lot of questions regarding my Sound-Card modem setup, so I greated a webpage with information on how I try to decode the 9600 baud AX25 packets that are transmitted by STRaND-1. Follow this Sound-Card Modem link for details. For those who want to test there Sound-Card modem setup, I have places IQ wav files on a web server you can download and test your setup. Make sure the audio levels from your audio out/in are high enough. Use the Sound card tuning Aid that is build-in feature from AGW Packet Engine. Good luck with your setup and leave me a note if this is helpful. After todays succesfull launch with a PSLV-C20 from Satish Dhawan Space Center (Sriharikota, India) the first signals are recieved from STRaND-1, this 3U nanosat that is build at the Surrey Space Centre (University of Surrey) using a Google Nexus-I as board computer. Here is a picture that I made from my reception this evening 25-feb-2012 19:00 UTC using a FUNcube Dongle Pro+, SDR# and a Maspro 435HS20. The next couple of days I’ll try to decode the IQ data that was recorded during this pass. Lets see if we can find the 9600 baud data within this IQ stream. I have updated the STRaND-1 page with information to decode the telemetry using AGW Packet Engine and AGW KissOnline. 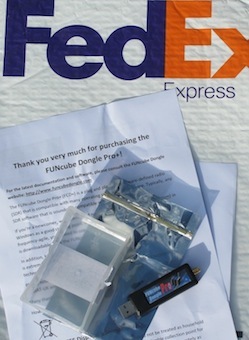 Yesterday I received the new FUNCube in the mail, It all looks very neat and Howard has left nothing to chance to deliver the SDR receiver in the right way. It is shipped in a professional manner, better than many companies. In the evening I finally had some time to test this FUNcube, it turned out that during the test there were tropo conditions and that explained why there were so many stations visible on the 192 khz bandwidth in the 2 metre band. 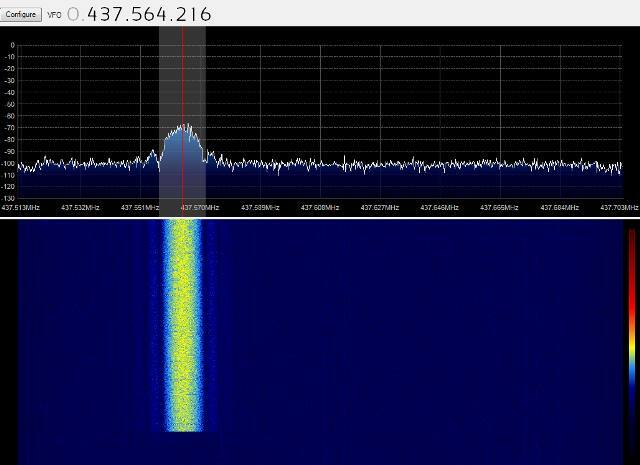 I did a quick scan of the AIR, 2m and 70cm band and it is immediately apparent that we are dealing with a better SDR receiver than the first version. In the next couple of days I will spend more time with the FUNCube and add some experiences to this blog. One thing though was amazing, I could received FO-29 beacon and the whole transponder passband on a vertical antenna, this had not worked previously. My current SDR setup, FUNcube dongle pro+, Diamond X5000 vertical, SDRSharp development version, high quality 2.5m USB cable and Windows 7 64bit.